Can you explain the tag? Is there a story there? It’s more dramatic than it sounds. “Suppressed” is the canonical term for a parish that has been closed by order of the bishop. Because the rural areas of the diocese are drying up faster than a puddle in Death Valley in July, many such “suppressions” have taken place around here. 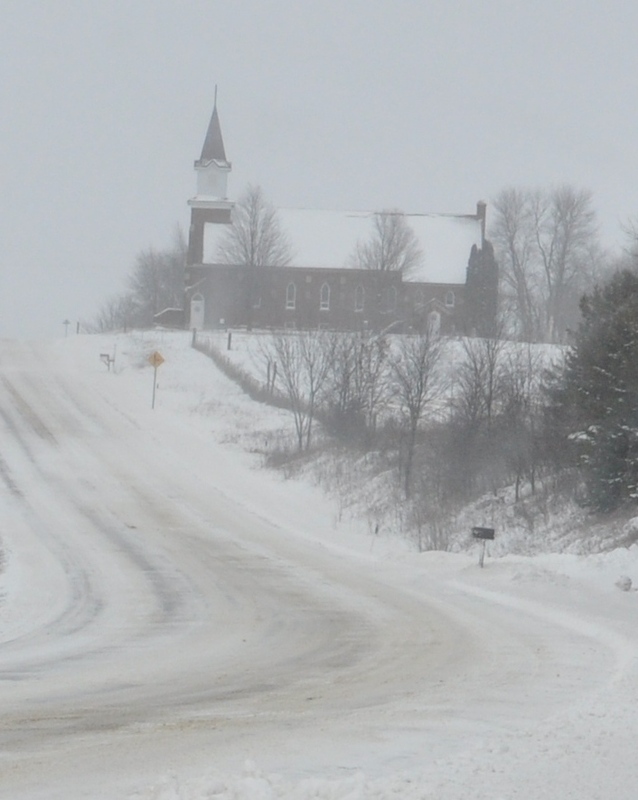 Often when I’m out on assignment, I will pass churches like St. Johns – closed because there aren’t the large farm families around anymore to justify such rural parishes. (Another parish of which this was a satellite is located about ten miles down the road). Part of me want to blame big agribusiness – but part of me knows its also the draw of the big city and, sorry to say, the sexual revolution, contraception, etc. What’s happening on the farms is also happening in the priesthood and religious orders, by the way – with a few wonderful exceptions of course. I posted this picture with the “suppression” title because it seemed to fit the ‘mood’ of the picture – subdued, etc. A play on words. A sprained cleverness, etc. It’s possible the churches closed because people were freaked out by all the armory, too. Sorry. Never mind. I misread that – I thought you were saying something about amour! I heard in my diocese next door the bishop of, say, the 1920s, promised that if 12 families could band together in a locality, he would plant a church and send a priest. So now we’re clustered like overloaded grapes out there. Back then 12 famlies easily translated into 144 souls at some point… At least if we’re talking rural parishes…But I suppose that’s a good kind of problem to have, maybe. Sort of. Well, maybe less than 144. In any case, now there is a problem that no one knows how to solve: mostly empty (but lovely) churches that need to be maintained, parishes that feel they are the property of a handful of families, stretched-thin clergy driving all over the place. Our former bishop told West MN that if these small churches refused hospitality to the the immigrants that now make up the majority of the Catholic population, God himself would close their doors. Not a comfortable man to know all the time but I liked his spirit on that. What would a place like that go for? Ask Shawn – maybe she knows.